15% Off On Mattresses For Black Friday. No coupon code required. Click link to activate. Up to 50% Off On Beds For Black Friday. No coupon code required. Click link to activate. Up to 35% off Wooden Bed Frames. Pillows from £7. No coupon code required. Click link to activate. 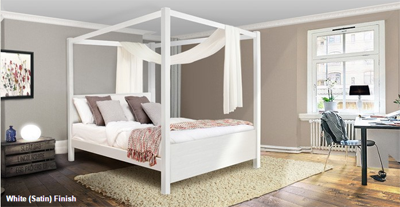 £358 off Four Poster Bed - Summer. No coupon code required. Click link to activate. London Bed From £357. No coupon code required. Click link to activate. Low Oriental Bed From £313 . No coupon code required. Click link to activate. 20% off mattress sale. No coupon code required. Click link to activate. Buy simple, natural, solid wooden bed frames and mattresses from Get Laid Beds. They also offer bespoke and custom sizing and can deliver in just a few days. Get Laid Beds specialise in the manufacturing of handmade, solid wooden bed frames, ranging from low beds to larger four poster bed frames and standard height frames. Buy single and double, king size, super king size and even super Caesar beds, as well as open-coil, pocket sprung or memory foam mattresses. If a bespoke length or width is required, they can manufacture your custom wooden bed frame and still have it delivered in as little as four working days.